James said teachers will be judged more strictly than others. Why? I think it’s because of the power they have. Teachers have authority because of their words, and words have power. Have you ever been with a pastor who got on a power trip? But you don’t always hear that. Sometimes pastors just insist, “I’m a pastor so you have to listen to me.” That sounds like a power thing. This was the attitude of the Pharisees, too. We have a lot of stories about Jesus and the Pharisees. We know that Jesus ate with the Pharisees. We also know that He read their minds. Then He blasted them for the thoughts He found in there! But shouldn’t we also take a look at how we make people feel? What if we are doing the same things as the Pharisees? If we are, then we need to take a time out, in order to reflect on that. If we treat people the way the Pharisees treated people, we need to rethink what we’re doing. If you’re called to be a pastor, I believe this means that you are given wisdom, and that you are called to share it. And I genuinely believe that most pastors are very sincere about their calling. But I worry when I hear a pastor say, “I was praying the other day, and God told me to talk to you about this.” When he says that, he is basically telling people, “This is what God said.” Now he can say whatever he wants. That’s why teachers will be judged more strictly. That’s not what they did at all. They simply said, “It seems like the Spirit was okay with our thought process on this.” For me, that’s a pure message. That’s the wisdom pastors are given, and then called to share. We should all pay more attention to the words in red. You know, Jesus. We should focus on His words, because those are the actual words of God. Not the inspired words of God, but the actual words of the Almighty God. Jesus carried those words. He spoke them into the world. They are the most powerful words in the history of words, period. God’s words. You can read them over and over again, and feel good every time. I mean, the actual words of God! More on this next time. See you Tuesday. Actually, she was very accepting of that, which was pretty interesting. I’ve been told that some of the kids in Larkin Street have been kicked out of their homes. They came out about their sexuality, and their parents kicked them out. So when I told her I was a follower of Jesus, I thought she would have a lot of reservations about me. But she accepted me. I didn’t assume she was gay. But I know that some of the kids who came to the game that day could have been gay. And they might have written me off, or maybe distrusted me, for being Christian. And I wanted to make sure they knew how I really felt. I wanted them to know how much I love them. I love those kids no matter what. I love that they dream. I love their dreams so much, because these kids are very motivated to become somebody. They are motivated even though they were kicked out of their homes by their families. They didn’t have anywhere to go. They wound up on the streets. They might have survived being trafficked. No matter what, I don’t need the details to know that really bad things have happened to them. And yet they don’t shut down. They dream big things for themselves. With these kids, I don’t want to say, “I’m a Christian.” If I do, their first thought could be that I am judging them, and that’s not what I’m about at all. All I want to do is express the love of Jesus. It’s getting harder all the time to say, “I’m a Christian.” I’m not afraid to say I’m a Christian. Never! But sometimes I’m embarrassed to say it. I’m embarrassed because Christianity comes across these days as a judging faith. And that’s not what following Jesus is about. Not at all. The way people view Christianity today is not like the way that outcasts and sinners viewed Jesus. They loved Jesus! They loved Him because they knew He loved them! As much as it is possible, I want to be viewed like Jesus was viewed, as someone who loves people. Do you think the Christian churches are doing enough to distinguish themselves from the Pharisees? More on this next time. See you Friday. Jesus the Lion, the King! When you carry something on your back, it’s a sign of strength. I’ve cheerfully taken up my cross to follow Jesus. I’m glad to do it. I seek opportunities to serve like Christ served. I’ve learned that discipleship is a source of joy. It’s the truest joy! I’ve even literally put it on my back. Paradoxically, though, there are those days when being a Christian itself feels like a burden. Sometimes we’re faced with challenges that seem insurmountable. We may not know what to do. We’re asking, “What does it mean to stand for Jesus?” And we really don’t know. We might even ask, “Do I want to stand for Jesus?” As shocking as it sounds, sometimes we aren’t all that sure! Living like a Christian can be hard. It can be really frustrating. Sometimes we can be profoundly selfish. Even when our spirit is willing, our flesh can get rebellious. What do you do when your heavy burden, the one Jesus offered to carry, is the burden of following Him? In times like these, maybe especially in times like these, our spirits long for Christ. We need reminders of who He is. That’s why I got a lion tattooed on my shoulder. You’ve seen a lion walk. He walks like he carries the world on his shoulders. But he does it with confidence. He’s strong. And when he looks at you, you see how brave he is. He’s full of courage. He is not afraid. Why should he fear? He knows he’s the king of everything he sees. Jesus is the lion. He’s the Lion of Judah. Jesus is the king! He’s the king of everything! And he gives us His lion mentality. Think about hanging out with lions. Watch what they do. Walking or laying down, the lion is very calm. He’s looking around. He’s just observing. But he can move into attack mode in the blink of an eye. We need that calm, that strength, that ability to act in an instant. This is the lion mentality. Jesus is my savior who carries my heavy burdens and gives me rest, but He is also the lion. Sometimes I need that presence, too. Sometimes I need Jesus, my king. There are days when I need a lion’s confidence, but I don’t feel it. There are days when I need a lion’s courage, but I don’t feel it. There are days when I need a lion’s strength, but I don’t feel it. Does it matter? No, because I know that Jesus has perfect confidence, perfect courage, and perfect strength. Always. 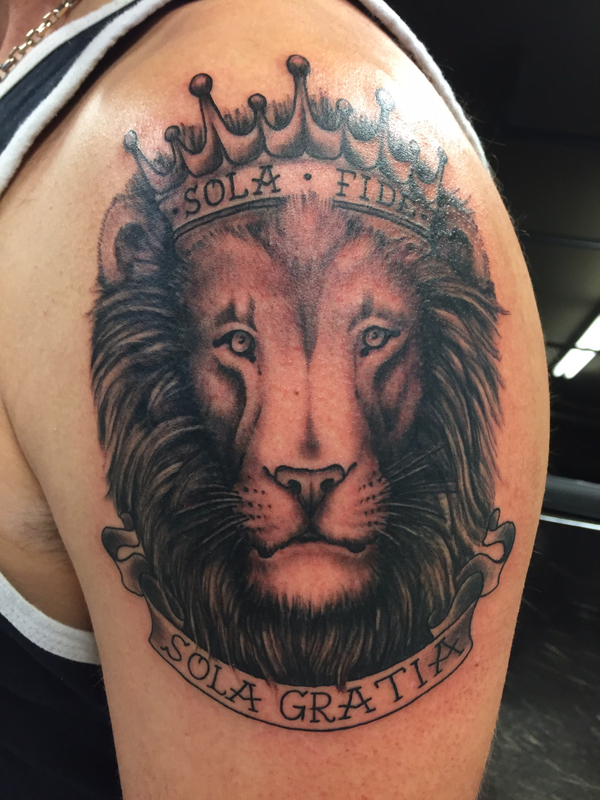 That’s why the tattoo says sola fide, faith alone, and sola gratia, grace alone. I know that when I need it, Jesus will give me a brave heart. He will give me the strength of a lion. And when I walk with the strength of a lion, so I walk with the grace of a lion. Jesus leads me to walk in His grace. I know those days will come when it actually feels like a burden to live like Jesus. There will be days when the temptation to feel frustrated, angry, and selfish is almost overwhelming. I know. But when that happens, don’t surrender. Remember the lion, and receive Him. Bless you. See you Tuesday. How do you know when you’re living in grace? Well, how much do you enjoy loving on people? If you’re enjoying it, then you’re probably living in grace. Living in grace is awesome. It’s joyful! On the other hand, if loving on people is hard work, then you’re struggling. It can be hard to find that place of joy. Even when you do find it, it can be hard to stay there. Trust me, I know. It’s easy to turn grace into struggle. Maybe you’ve been wounded. Even if you haven’t, people can still hurt your feelings. Or those wounds can get more painful. No matter what, we can all get triggered by something. When that happens, we try to use our own power. We say, “I don’t want to talk about it.” We don’t want to be transparent and vulnerable. So we resolve to deal with it on our own. We hide our feelings. We try to move on. We just want to get back to living in grace, back to that awesome, joyful place, where we’re loving on people and it feels wonderful. Of course, hiding our feelings doesn’t help us get back to that joyful place. Hiding our feelings means that it’s only a matter of time before everything boils up and we explode. Boom! It happens! And when it does, the people around us are shocked. To them, it seems like it came out of nowhere. They’re confused. “Why did he just get so angry at me?” They don’t understand. How could they? This is what happens when we hide how we feel. It definitely doesn’t help us find grace. When I’m afraid to be vulnerable, I try to work things out by myself. I shut everybody else out. You know what? It’s hard. It’s exhausting. The harder you have to work at something, the more likely it is that you’re trying to do it on your own. If you’re working so hard at something that you’re exhausted, it’s a really good sign that you’re trying to handle it all by yourself. And the truth is, all you’re doing is trying to control things that you can’t control. This is especially the case when it comes to other people. To hide and protect ourselves, we try to control other people. You know, you kind of get selfish! The good news is that God sees us struggling. He sees us trying to handle everything on our own. He knows it’s lonely and hard. So He reminds us that we aren’t alone. The Bible also says, “Boast instead about what Christ has done!” What did He do? Nothing less than this: He made you who you are. You’re in grace already. You don’t have to crush yourself in struggle. I’m very familiar with this. We all are. When I’m trying to do something, and I’m failing, I tell myself I’m failing because I’m not trying hard enough. So I try harder. Then I fail more. And then I just get frustrated. What if I’m wrong? What if I’m failing because I’m trying too hard? The letters in the New Testament talk about this. The harder you try to live in grace, the more you’re going to fail. The harder you try, the more you’re going to let yourself down. Now that’s a prayer! Because when you’re free, you can stop trying, and start living. When you have Christ, you aren’t alone. You don’t have to try to handle things by yourself. You have Him, and there is no weakness in Christ. Christ is strength, and He is strong in our weakness. One of the hardest lessons to learn is that it’s not all about you. You are not alone. So it’s not about you. It’s about Christ in you. It’s about Christ in me. Outside of Him, we fall to all kinds of temptations. But when we live out of our identity in Him, His strength conquers it all. Living in grace is not about trying. It’s about understanding. He is in you. Grace is in you! Let Him live through you. I’ll give you a simple prayer, one you can use every day. “God, give me strength to represent you today.” And then just live. Because the stronger you are in Christ, the less you’re going to react. The stronger you are in Christ, the less you’re going to be wounded. That strength is going to make it easier for you to be transparent and vulnerable. You can let people know when you’re hurting, because you can be confident in who you are in Jesus. You don’t have to hide. Not in your sin, and not in your wounds. You don’t have to worry about being weak. You can tell people, “This is where I can be hurt.” You can safely say, “This is where I can be wounded.” It’s a strength to be able to say that. Do you know why? Because it allows Jesus to love you through those people. There’s no “trying” to live in grace. Just live out who you are. In Christ. Christ in Jeremy means that I’m going to live in servanthood. Christ in Jeremy means I’m going to live with grace for people. I trust that God is going to allow me to live this way. When I feel I’m failing, I will pray. I will ask for His strength, because that’s the only way. God is always saying, “Give me your burdens. My yoke is easy. And it’s light.” Life with Him is not necessarily going to be easy, not in worldly terms. But if you trust and lean on Him, it will seem easier. Take the time you need. Tell Him, “Look, God, I’m not feeling like I can do this right now. I need you. Help me, so that this will be less of a burden.” He’ll be strong in you, and you won’t believe the relief. Bless you. See you Friday. Well done. This doesn’t mean that I have a works mentality. I truly don’t believe my works will get me to heaven. My faith will get me to heaven. That’s it. I’m justified by my faith. But I will show you my faith, in the things that I do. The works I perform are the result of the faithful life I try to live, every single day. You can boil my whole theology down to one concept: discipleship. I try to live the lifestyle of Jesus. Some people say that James and Paul were having a disagreement, but they weren’t. They were talking about two different things. When Paul said that you aren’t saved by works, he meant that works alone will not get you into heaven. Paul said, “Look, you can’t work your way into heaven.” In my belief, that’s true. James is talking about a whole different idea. James is talking about the believers, the ones that have already given up their souls to God. When James said, “I will show you my faith by my works,” he was talking about the lifestyle that you live when you’re a believer. The apostles did not just sit around. If they did, we’d have no Acts of the Apostles to read, would we? Nor did the apostles go around doing whatever they wanted to do. Want proof? Look at the persecution they endured. They certainly weren’t persecuted because they were living for themselves. They were persecuted because they were living for Jesus. Discipleship was not easy! The disciples showed us how to live. And that’s what James is saying. Show me a believer that lives the lifestyle of Jesus. That’s Christianity. But what if you show me a lifestyle that is without works, a lifestyle where you don’t do anything? What is that? You say you have faith. Let’s see it! Are you doing good works so that God will smile on you? When I meet people motivated by a works mentality and ask them how it’s going, they invariably say, ”Ugh. I’m exhausted.” Yes, you are. The works mentality will exhaust you. It will burn you out. You will never be able to do enough to feel like you’re righteous! Bottom line: a works mentality doesn’t work. Don’t weary yourself this way. Jesus died so that we would be made holy and righteous. That was His sacrifice for you. Let Him in. The Bible says that the power of the cross is meaningless to those who don’t understand. So let’s understand. Why did Jesus sacrifice Himself? He did it so that you, in your human flesh, wouldn’t have to make yourself righteous. He did it so you wouldn’t have to perform this impossible task. That was the concept. Jesus earned your place in heaven. He did it for you! He knew you could never do it for yourself. Jesus, the only man that walked the Earth with perfect thoughts, did it for you. Now you never have to say, “God, look what I did to receive the Kingdom of Heaven.” You don’t have to work to exhaustion, failing yourself every day, being ashamed of who you are. I know it’s hard to come to grips with that, but when you do, you are transformed. Man, Jesus! You did that! You did that to eliminate sin from our lives! Now we don’t have to be afraid of God! And if that wasn’t enough, you resurrected! You conquered death. Now we don’t have to fear that either! Jesus, thank you. You brought me into the Kingdom, to dine with the King. Every day there is a wedding feast because of all the new people coming in, and I get to go. Every day! I’m allowed at the banquet table no matter what I’ve done, because Jesus has stood in for me, and by His death, made me holy and righteous. The blood of Jesus has been poured over me. I confess that. Now God doesn’t see my sins. He doesn’t see my sins! He sees me! And He loves me. We are all precious in His sight. Jesus broke your bonds of sin and shame, fear and failure. Now you are welcomed and loved for who you are: His beloved and precious child. Second chances are so important. We all need one. We all need a lot of them! And that’s why we turn to Jesus. His blood is so powerful. There are too many things working against us now, here in the world, telling us to live the wrong way. We need His blood. Without it, we have no hope. This is also why we need to do justice now. We can’t wait for Jesus to return. It’s our job to show others what Jesus showed us. We don’t wait for Him because we have to reflect Him now. People don’t really understand who He is, and without Him, they have no hope. Who is He? For one thing, He’s a risk taker. He entrusted the Gospel to twelve men and a prostitute. He gave them the Gospel to take into the world. He relied on them to show people who He was, and then to remind people who God is. And Mary and those men did it. They did it well! And now He’s asking us to do the same thing. He’s entrusted His Gospel to us. We have to continue that heritage. We have to continue the legacy left to us by Mary and the apostles. We have to show people who Jesus was. Some people have lost sight of that. Some people think that the legacy of Jesus is make sure you go to church on Sunday, hang out within four walls and a roof, and then go home. That is not the legacy of Jesus! Jesus walked the streets! He hung out with people. He hung out with sinners, and He didn’t judge them. Jesus knew how hard it would be for us. So He showed us how to live and then He gave us a second chance. Then, He asked us to make sure the world understands.